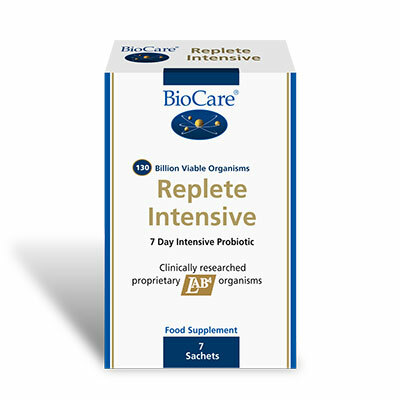 BioCare’s Replete Intensive is designed for intensive, short-term use, in particular to help establish healthy gut flora quickly and can be used alongside, or immediately after antibiotics. SKU: BIO30507. Categories: Probiotics & Prebiotics, Daily Packs. Replete Intensive delivers a staggering 130 billion viable probiotic organisms per day, providing the unique LAB4 complex which contains two strains of lactobacillus acidophilus and two strains of bifidobacterium bifidum, chosen for their acid tolerance and high adherence to the gut wall. Also the transient strain of lactobacillus bulgaricus is included to help provide a maximally beneficial environment for the other strains to thrive in. Guaranteed 130 billion potency per daily intake to end of shelf life if stored correctly. PLEASE NOTE DURING PERIODS OF HOT WEATHER DUE TO ITS EXTREME WE WILL ONLY SUPPLY THIS PRODUCT TO ORDER AND CANNOT SHIP IT ON A THURSDAY OR FRIDAY AS IT COULD STAND IN THE SHIPPING DEPOT ALL WEEKEND. Provided as a 7 sachet pack. One sachet dissolved in water and taken before breakfast for 2-7 days or as professionally advised. N.B. In some instances, Replete may initially increase flatulence and bloating and cause diarrhoea. If discomfort continues, discontinue use. 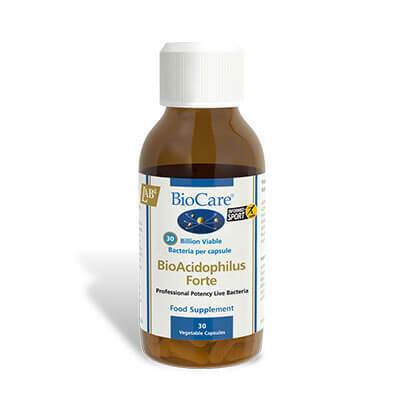 Can be used in an anti candida regime with care. It is advised that Replete be used after all anti-fungal products have been completed to maximise the potential for effectiveness. Can be used as a 'one-off' gut ecology repopulation product. Please consult a docotr before use if you are under medical supervision.